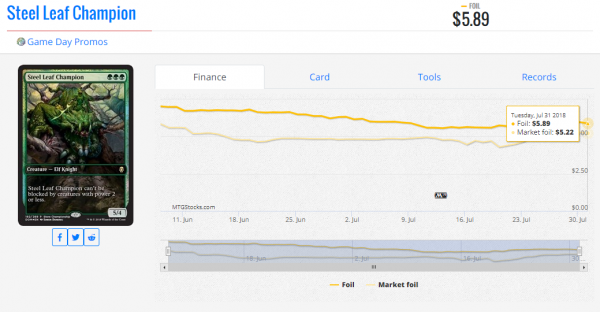 Many people often mention the “summer lull” when it comes to MTG finance. But Warren Buffett once said that as an investor, “It’s wise to be fearful when others are greedy and greedy when others are fearful.” I think greedy is a strong word here, but it gets the point across of making profitable investment decisions. 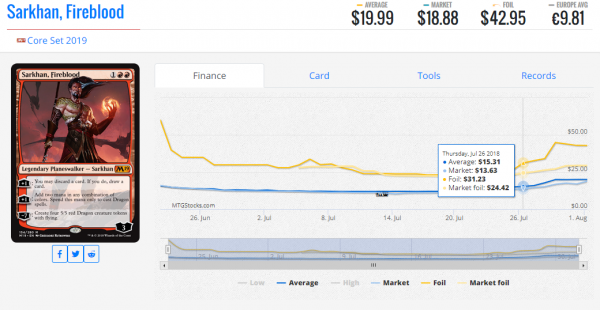 This year has been a perfect example of how to turn the MTG finance summer lull in your favor. 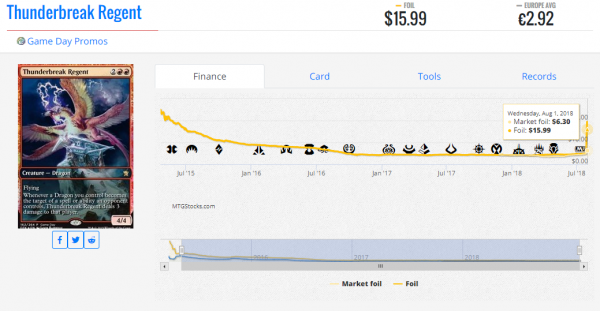 For example, I’ve highlighted some key cards from M19 in my previous articles like Sai, Master Thopterist, Thorn Lieutenant, and Supreme Phantom. And don’t forget about the upcoming Pro Tour 25th Anniversary from August 3-5 that I’ve also mentioned. This will bring us even more data we can use to make some wise decisions on cards to pick up cheap and cards to get rid of before they tank in value. So be sure check back regularly to stay abreast of what’s happening before the market shifts. I suggest bookmarking or adding my articles to your feed. 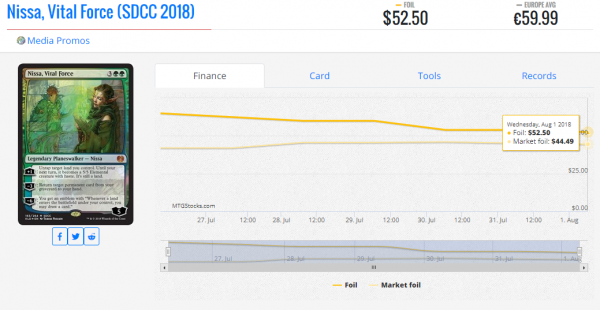 In my last article, I tried something new: tapping into the readership for feedback on whether certain cards are ‘holds’ or ‘folds’. So for this article, I’ll be putting that feedback into action. 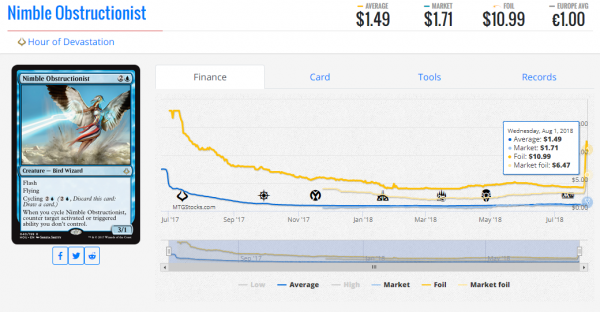 In addition to that, I’m including a new section called Updates to reflect on cards mentioned in previous articles to help you see where we are with regards to any recent market shifts rather than wait to do a monthly, quarterly, or yearly review. Yes, $65 is a lot for a Magic card. But this version will probably never get any cheaper. 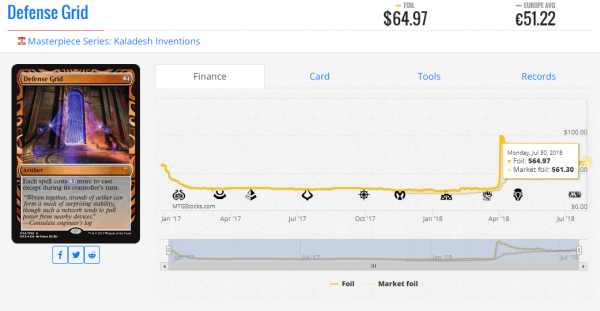 If you take a look closely at the graph, you’ll see that the foil and market foil prices have almost come to a meeting point. And from here on out, the market foil price will be the standard and continue to rise. Kindly take a look at this list again. Defense Grid is the only card that’s under $100 aside from Steel Overseer, Pithing Needle, Trinisphere, and Hangarback Walker that sees play in multiple competitive formats. It sees play in Modern’s Ironworks Combo by Sebastian Pozzo and Legacy’s Sneak & Show by Timothy Candee. These are two of the most powerful decks in their respective formats. This probably has even more potential to grow compared to Defense Grid since it sees play in multiples in different decks across Modern, Legacy, and Vintage. Most notably, it’s showing up as a four-of in each of these new Modern decks: Bridgevine by KOZOUKUN and Hardened Modular by VELHOVENTURA. Mono-Green Aggro by Brendan Hicks is one of the better decks in Standard right now and will most likely be around after rotation in the fall. And Steel Leaf Champion will probably always be a four-of alongside Llanowar Elves. There were three in the top eight of SCG’s Indianapolis’s Standard Classic last weekend. The cool thing about Steel Leaf Champion is that it’s semi-secretly making its way into Elves by Bevanz in Modern as a four-of as well. And it’ll only get better as more Elves are printed. You can read a little bit more on Modern Elves from Adam Yurchick here. And here’s a bonus side note…if you want to test this deck out, I suggest replacing four of the Forests with four Overgrown Tombs. This way you can consistently cast Shaman of the Pack and Maelstrom Pulse on turn three based on Frank Karsten’s mana guide. And if you also want to cover the two Abrupt Decays, replace a fifth Forest with a multicolor land like Mana Confluence or you can play a Verdant Catacombs or a cheaper fetchland like Windswept Heath so you have thirteen black sources on turn two. Finally, I can’t reiterate enough how promos are the next buyout specs according to Chas Andres. Jeff Hoogland just made top eight of the SCG Indianapolis Open last weekend with UR Wizards. And he drew kind of poorly on top of possibly making a mistake or two in game three against Humans. If it weren’t for that, he might’ve taken home the trophy. However, Nimble Obstructionist doesn’t really see play outside of his deck; so I’d sell into the hype. 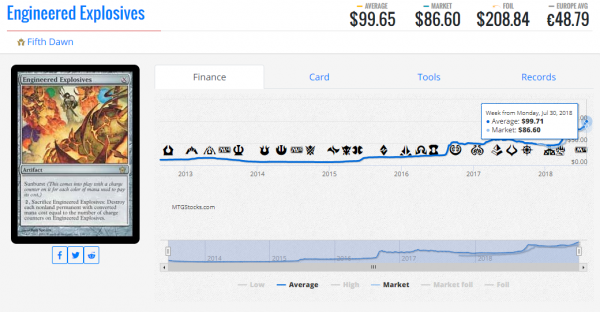 If you want to play the deck, just get or keep a non-foil playset since prerelease and pack foils are already a bit overpriced. Thanks to David Scott for the feedback on the previous article. Although these will both be rotating out of Standard in the fall, they’re both played in Eternal formats with Chandra seeing more play than Gideon because she pops up in Legacy via Mono-Red Prison by Pierre-yves Claudon. Many people love Terese Nielsen; and rightfully so, because the artwork on these are amazing. But I would stay away from the other three since none of them see play outside of Standard except for Nissa, Vital Force, which sees play as a one-of in Elves once in a great while. Thanks to Rajib Ali for the question about Sarkhan, Fireblood. 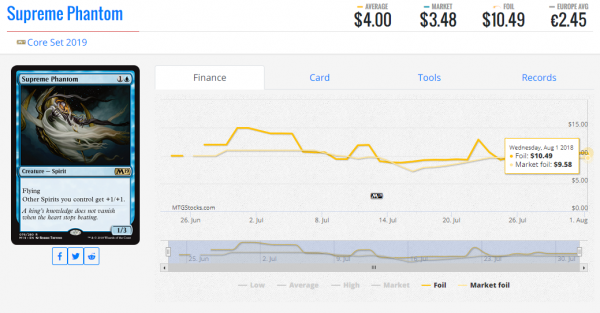 If you visit the link, you’ll see that I replied to Rajib on July 26 and suggested to pick up foils under $25 if possible. Now the floor for foils is about $40 according to TCGplayer. 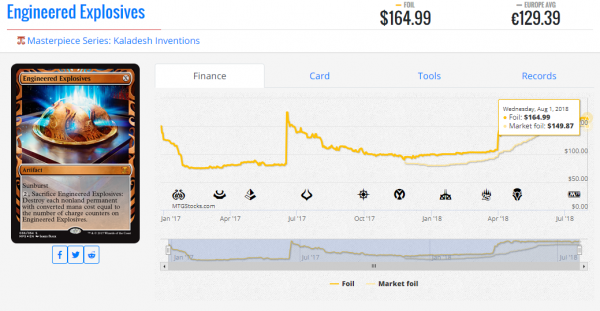 So if you bought any then or held the ones you have…congratulations, your foil Sarkhans have increased in value by $15 in less than two weeks. However, I would fold any extra non-foil copies you have and sell into the Skred Dragons hype. Card Kingdom is buying copies for $15 cash and $19.50 in store credit. Card Kingdom is now sold out of these. And copies on TCGplayer are drying up starting at $160 instead of $150 now. Card Kingdom only has three copies at $11.99 instead of $10.99 now. And there aren’t many Prerelease or pack foils on TCG Player under $10. Well, there’s the spike we were looking for. Card Kingdom is sold out. And TCGplayer only has a handful starting at $15. I just got my $51 cash from Card Kingdom, but I think I might’ve goofed on this one. The cheapest one available on TCGplayer is $90. Wow! This is probably another good sign that the Inventions version is about to pop. I would still try to upgrade any Fifth Dawn or Modern Masters versions you have to Inventions as soon as possible. These are going to tank as soon as a reprint spoiler happens, but the Inventions version will just keep going up. Here’s a bit of that counterintuitiveness we saw in the previous article. Use the spike to sell into the Skred Dragons hype if you don’t plan on playing the deck or play Thunderbreak Regent if it’s ever reprinted in Standard. Alright, I hope you’ve enjoyed me putting the reader feedback into action and the updates on holds and folds in previous articles. Don’t forget to post your hold and fold questions in the comments below to keep the train going. I really like Steel Leaf Champion. With the 8% ebucks recently, I stocked up on 12 copies. Post-rotation, once red loses several weapons, it’s possible the aggro landscape could instead shift to green. The great thing is the card is strong on its own and isn’t necessarily elf-tribal dependent. It also pairs well with Sarkhan’s Unsealing — a great low-cost spec imo if you don’t mind splashing red. “Sarkhan, Fireblood” was a nice spec I agreed with. Its success piggybacks off what I said earlier with red losing weapons post-rotation. If red survives, it will be on the backs of dragons. I think dragons also appeal to the Timmy gamers. I’m still high on Verix Bladewing; a mythic dragon for under $1.75. Nice job on Steel Leaf Champion! Looking forward to if this actually pays off for you (and me) or not. Time will tell! 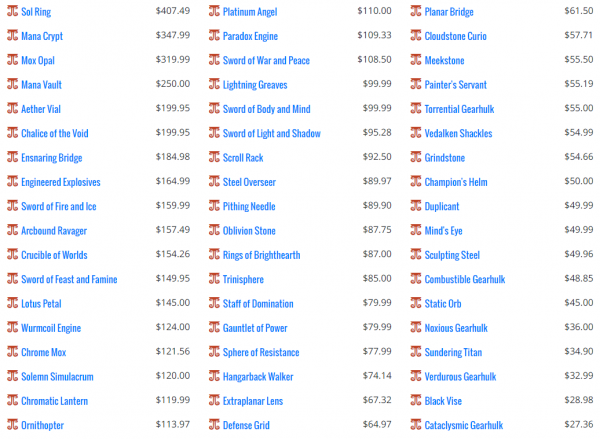 I’m not sure about Sarkhan, Fireblood in Standard yet. Dragons might be too slow. But it is a three-mana Planeswalker that has some pretty strong abilities. The best part about it is that it’s already shown playability in Eternal formats which is why I think foils are a hold. I think non-foil and foil versions of Verix are a hold right now too. 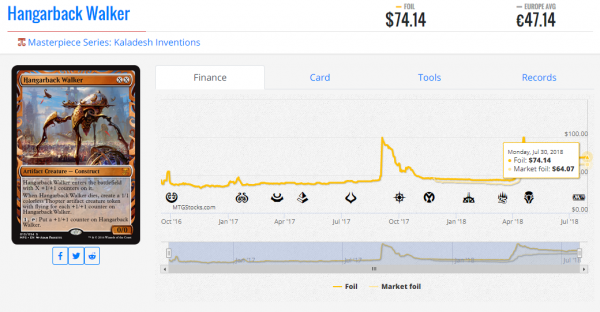 Ty Thomason from article #3 (https://www.quietspeculation.com/2018/07/hold-em-fold-em-3/) actually asked me about this before. I’ll probably highlight Verix in my next article. Keep on the lookout for that later this week!